We love a good proverb, and there’s so much to love in this one. Yes, on the surface of things we may not find laughter and rest a cure to every ailment or illness, but positive thinking and lifestyle habits can improve prognoses and – some would argue – do have the power to cure. Certainly when thinking of our daily lives, when something or someone really genuinely makes us laugh it can be a release that can alter our mood and even change the direction of our day. Perhaps you’ve experienced the effect sleep can have on your emotions – that thing someone said the day before that left you feeling so hurt and upset that somehow fades in significance the following morning. Or perhaps you’ve experienced those moments of physical healing when you’ve tucked yourself into bed with a fever, only to awaken hours later and sleep has helped your fever to pass. Or maybe you’ve experienced the power of sleep in a more cerebral context as the illusive answer to a problem miraculously reveals itself following a good night’s sleep. Sleep is a great healer so look after your sleep and your sleep will look after you. 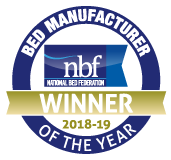 Discover #perfectsleep in 2019 with Millbrook Beds.